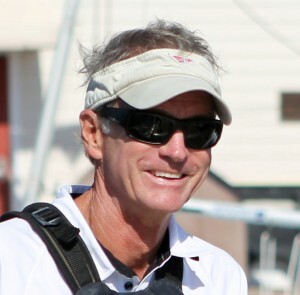 Greg Fisher, is a former Collegiate All-American and world-renown expert in the sailing community, is in his fifth season as Director of Sailing at the College of Charleston. One of the most accomplished competitors in United States sailing history, Fisher has captured 22 North American or National Championships in seven different classes including the J/22, Lightning, Thistle and Flying Scot over the course of his expansive professional sailing career. A past World Champion in the J/22 Class, he most recently skippered to a first-place finish over 104 other teams to claim the Lightning North American Championship in 2014 in Sheboygan, Wis. He was fourth in the Lightning World Championships in 2015 at Pt. Abino, Ontario. Fisher started his own sailing making business in 1978, and worked as a sailmaker for North Sails One Design in Annapolis, Md. From 1991 to 2010. Now he is in charge of growing the College of Charleston collegiate sailing program as the Director of Sailing. Last season, The College of Charleston Sailing Team captured its 6th ever Fowle trophy victory -for “The best college sailing program in the country” and the second since Fisher joined C of C in 2010. The C of C varsity team has claimed 6 Collegiate National Championships in the past 5 years in the Coed Dinghy, the Match Race, The Team Race, the Men’s Singlehanded (2) and the Kennedy Cup for the College Offshore National Championship. A native of Columbus, Ohio, Fisher was captain of the sailing team at Ohio Wesleyan University before transferring to Miami (Ohio) University to sail on the same team as his brother, Matt Fisher. He earned All-America honors at Ohio Wesleyan in 1975. Fisher, was a former Chair of the US Sailing One Design Class Council and Championship of Champions Committees. In 2000, Fisher co-wrote a book with author and former US Sailing President Tom Hubbell entitled, “Sailboat Racing with Greg Fisher” published by Hathaway-Jones Publishing. He shares his passion for sailing with his wife, JoAnn, and has four children, Martha (29), Kurt (27), Bessie (22) and Addyson (10), who all also enjoy the sport of sailing.